The fleet spend another day in Portsmouth but is there good weather on the horizon? Normally there would have been a lovely lie in for crews this morning but a howling wind returned in the early hours and crews awoke to another grey overcast sky. Some retail therapy at Gunwharf Quays was on the agenda for most today. The crew of Italian Job took the opportunity to go up the Spinnaker Tower. One of the largest aircraft carriers in the world, the USS George HW Bush is anchored in Stokes Bay and many of the 5300 sailors will be visiting Portsmouth tonight. The MBM team braved a choppy Solent to take a look. 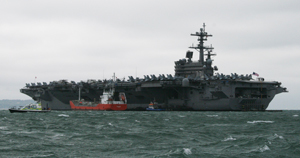 The carrier was an awesome sight and loomed large off Gilkicker. Its decks lined with fighter jets, it carries ninety aircraft and a nuclear reactor gives an un-refuelled range of 20 years. A briefing was held on the pontoon at the stern of Blue Fin at 6pm. There is a better forecast for tomorrow, after a final early morning weather check, support RIB Time Flies will go out to check the conditions for the possibility of a cross-Channel passage to Cherbourg. Tonight the sun has made a welcome appearance, the wind has dropped and the sky has cleared to reveal tantalising blue sky. It’s going to be a lovely evening.